Slipping on my pants and shoes quietly so as not to wake up the others, I was excited. I snuck out to the grape vines and began my walk. The overwhelming smell of sweetness and wine was delicious. 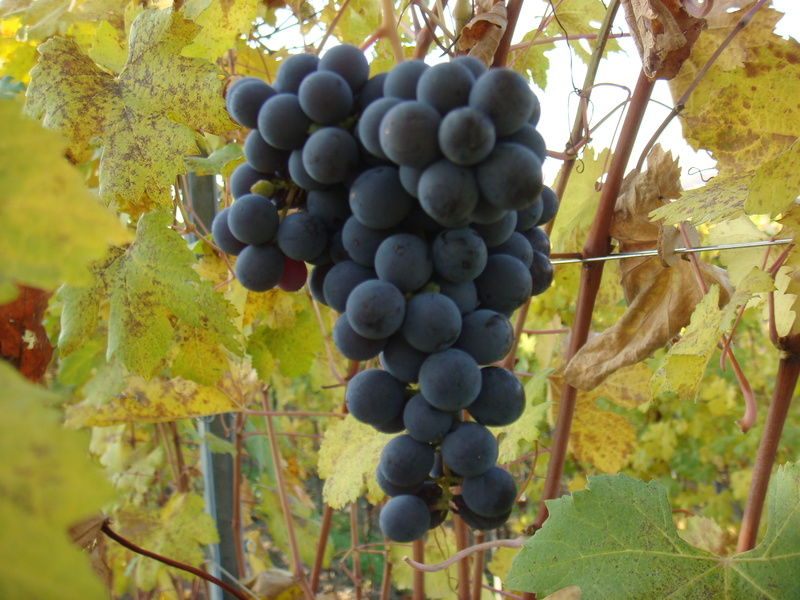 Along the way I stopped, of course, to eat the violet grapes that swelled on the vines. My first impression was sweetness, then sour, as I bit into the skin. Sweet sticky juice ran down my chin as I finished a bunch. After completing my march down the hillside of vineyards I hiked back up to the 5 star hotel, Il Boscareto, where we were staying for a few days. 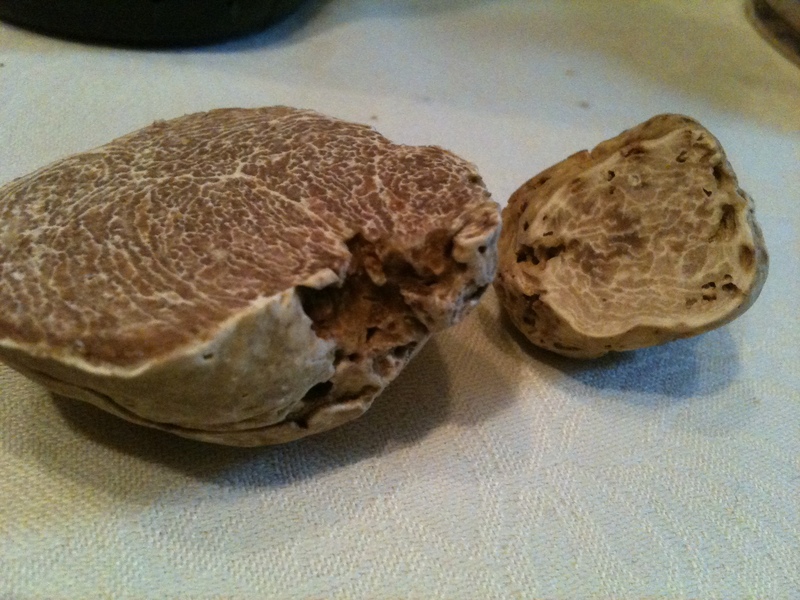 My head swam with thoughts of the hunt to come later that morning- for the famous White Truffles of Alba! We drove across narrow roads with row after row of vineyards on both sides. The yellow and green colored leaves on the vines were unbelievable. It was a valley of colors spread out over miles. We pulled into an old stone driveway where our trifulau (truffle hunter) greets us with a wide grin on his face. Of course he speaks not one word of English, so lucky for us we brought along our wonderful Italian guide (and now good friend) Daniela, to help us. We hop into his Jeep and drive aggressively into the woods. Once we reach a particularly hidden trail he lets Jolie out. Jolie, the trifulau’s dog, is six years old and has been trained since she was 6 months old for this very moment. The dog began to dart back and forth with her nose down. 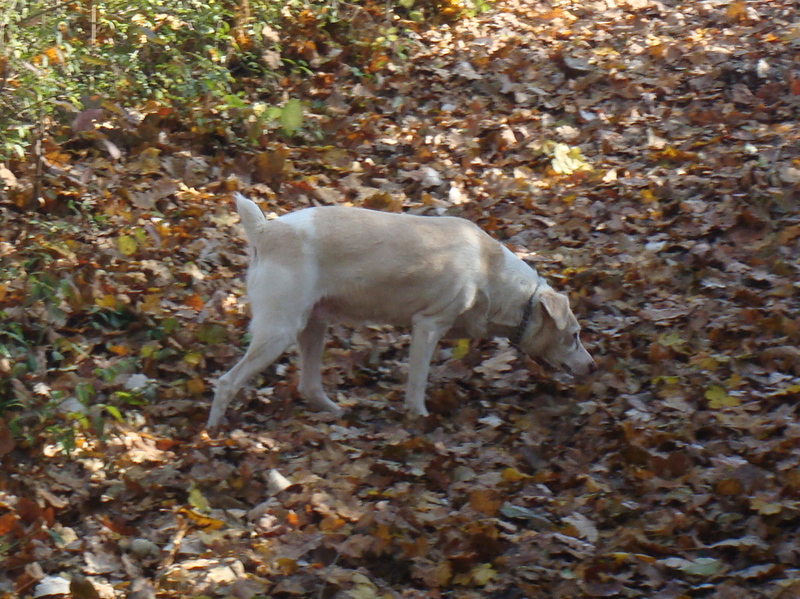 She trotted up and down the trail while our trifulau prepared for the hunt. Of course, I’m wearing fancy shoes and jeans instead of dirty pants and a shirt, but he assures me it will do. He pulls out hand-crafted walking sticks and hands them to us without a word. It was self-explanatory; we would be doing extensive hiking. The hunt began quietly as our trifulau whispered short commands to Jolie. and concentrated on Jolie and her welfare. Once Jolie was calm he set out digging for the white truffle himself. He latched his ax into the soil and tugged slowly and carefully. As more dirt poured away, a garlicky, dreamy smell arose from the small hole. Then it hit us. With full blast the perfume blew us all away into an everlasting silence broken by Jolie’s squealing and her own attempts to reach the golden truffle. I put out my hand in the ground slowly, and with extreme caution brought out a medium sized truffle. We were thrilled and so was the trifulau. The hunt concluded with our finding two truffles, one weighing 52 grams, and one weighing 23 grams. These truffles were to be used in the meal we had after we got back to the inn/restaurant. As we stepped into the restaurant, which smelled throughout like truffles, our trifulau was applauded by his guests. He went to change as his new role was as host of the delicious meal prepared for us by his wife and proudly served by both of them. ~ by David Fishman on December 19, 2009. Any recommendations for food on the Jersey side of the river or close to the Jersey side? It was nice meeting you last night. I feel like we didn’t finish our conversation before you were dragged away. You were in high demand last night. This sounds like an amazing experience.